Why do the silent start speaking in sequels? I’m sure that if I asked you to name your favourite video game characters, your list would include one or two silent individuals. Many of the most legendary protagonists are taciturn, and are often respected for staying quiet. Unvoiced characters often let their actions (or their games) speak for them. Whilst many of these voiceless stay hushed, the decision to grant speech has occurred in many game sequels. In the past, this could be attributed to what games were capable of doing – voice acting in video games didn’t develop until the 1980s. Nowadays, this character change needs to be considered carefully. In my opinion, the addition of a character voice can change the very foundations of a game. Occasionally, a franchise will eject its original silent protagonist for a speaking lead, which has a definite impact on how the next game plays out. 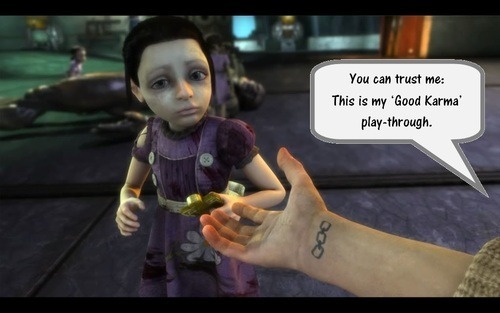 Below are a few examples of games that gave their heroes permission to speak. I discuss how I reacted to the change, and the difference that change made. “Oh my word” we might say. “There are an awful lot of monsters trying to chew my face off. I am slightly perturbed by this predicament, and find this whole scenario quite taxing.” And so on. Isaac Clarke however relies on a series of grunts and groans to communicate his feelings as he trudges, stomps and blasts his way through his own personal nightmare. At no point did I find Isaac’s silence off putting. On the contrary, in a game where isolation and paranoia factor heavily, the absence of a lead voice added to the atmosphere. Mr Clarke was alone and he knew it. 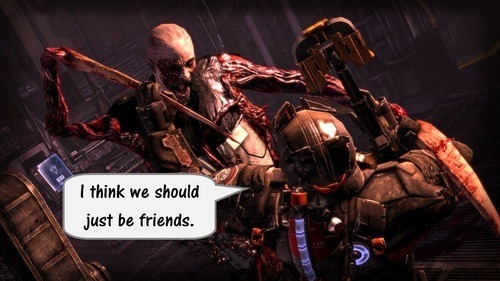 Then he starts talking in Dead Space 2. I know why they made the decision; I understand that they wanted to flesh out the story and the characters. At the end of the day, it hardly breaks the game. I just didn’t appreciate the change. The inclusion of more speech detracts from the lonely-helpfulness of the original. There were some other people in the first game, which Isaac refused to speak to, but in the second game he jabbers on with anyone who will listen. If he can talk, why did he never call out to his girlfriend in the first game? That was the whole reason he was there. I also never felt that Isaac needed more character. Dead Space was a game designed to scare the player, to make us feel insecure and lead us to question what was going on around us. We didn’t need to connect with Clarke to play the first game, so why are we being told to make friends with him in the sequel? Jak and Daxter are a little arrogant. They celebrate the collection of every Power Cell with the bravado of an entire football team. There’s a level of self-assured smugness about Jak too. In the end though, he turns out to be a charming protagonist. In Jak and Daxter: the Precursor Legacy, his physical reactions – eye-rolling, shoulder sagging, head shaking – convey all the audience needs to know about the current situation. 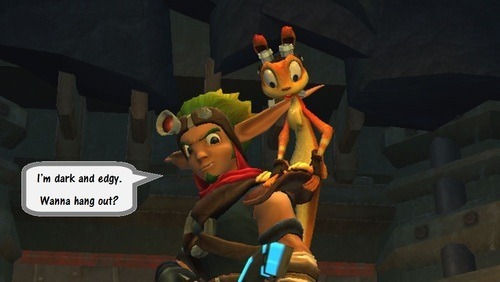 With the bubbly Daxter quipping from his shoulder, Jak was never called on to say anything. He didn’t need to; he was the hero and he was going to get things done, high-fiving and fist-bumping all the way. Then Jak is given a voice. Not just a voice though, he gets an overhaul. Everything from his hairstyle to his underlying personality were remodelled. The sequel itself is leagues apart from the predecessor. The series took a sudden left turn into ‘dark and edgy’ territory, and slung a pile of personal baggage over Jak’s shoulders. The overhaul is one of the reasons why I personally accepted the ‘Talking Jak’. The transition itself is dealt with pretty well. There’s a defining moment early on the game when Jak begins talking, and it’s instantly used to show that the hero has gone dark and brooding. He never needed to say anything when he was happy saving the day. After two years in prison he’s got issues he needs to resolve. Daxter’s comedy relief is not only welcome, but is now also pretty important in keeping Jak on the right side of the line that separates Good and Evil. The jokes at the expense of Jak’s former silence are a nice touch. The Call of Duty games are full of mutes. From World at War to Black Ops, the world is seen through the eyes of numerous people, and most of them remain hushed. 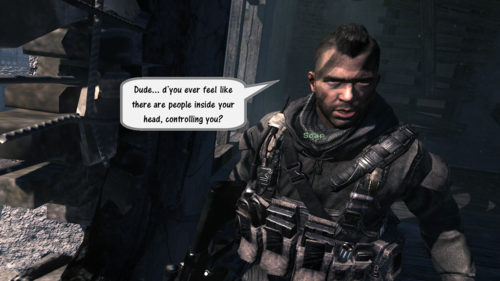 There are (and I’m sure to be chastised for a miss-count) six playable characters in the first Modern Warfare and the majority of your time is spent in the head of John MacTavish. He’s happy to act as trigger finger for the player without making a sound. This lends itself to the ‘every man’ feeling of the First Person Shooter; you’re playing as a character, but it’s really you that’s saving the day. When Modern Warfare 2 rolled round, “Soap” MacTavish got a voice. The problem is… he’s really weird about it. When he’s a Non-Playable Character fighting alongside you, he’ll chat freely. When you take control of him in the final few missions of the game, he goes quiet again. It could be that MacTavish is conforming; maybe the “CoD characters don’t speak in first-person” is actually a strictly enforced rule. Either that, or when the player ‘pilots’ MacTavish, they’re actually sitting on the part of his brain that controls speech. As mentioned, sometimes it’s the game that changes rather than the Player Character. When Claude rolled up in Grand Theft Auto 3, the franchise was greatly advanced. The world was now 3D, the story and characters more fleshed out. The one thing that was yet to change – Claude, like his ancestors, was entirely silent. He would walk up to a payphone or into a cutscene. The mission giver would talk at Claude, congratulate him on the good work he had done so far, and then offer him a new mission. Then Claude would walk off again. Half the time, he wouldn’t even nod or show any sign that he had understood the instructions; he would just leave. The fact that Claude was mute (he is the one very literal mute on this list) made no difference to the enjoyment of this Grand Theft Auto. In fact, from an immersion/gameplay point of view, it could be argued that his lack of voice made sense. The fact that he never comments on missions or describes how he feels about characters illustrates that Claude is not invested in the story, which (let’s face it) many people wouldn’t be either. It often seems strange in later GTA games that the protagonist will spend two minutes of a cutscene expressing raw, barely-controlled hatred for an antagonist in the game, but between missions the same character can spend their time collecting taxi fares or shooting pigeons. Claude’s lack on investment makes sense inside the GTA sandbox. Having said that, the Grand Theft Auto games that followed have all been superb. The next instalment, Vice City, still holds the title of ‘favourite GTA game’ in my brain. 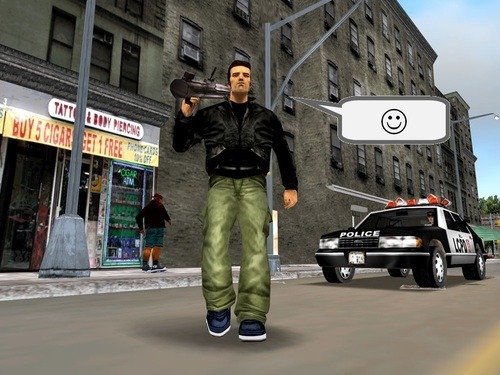 Whilst the more story-driven approach tends to go against the free-roam nature of the franchise, allowing protagonists like Tommy Vercetti and Niko Bellic to talk has made (at least) one positive change to series: whoever you are playing as…it’s their story now. In GTA 3, you’re completing a random bunch of missions for other people; fixing their problems for them. From Vice City onwards, you were completing missions so that you could succeed; fixing problems so that you rise to the top. This is the most recent transition from silent protagonist in the list. Again, the new, talkative character also came with a bold new direction for the series. Or at the very least, a new altitude (look at how clever and witty I am). Jack isn’t completely silent in BioShock. He says/thinks an introductory statement, and then shuts up for the duration. Just as Isaac’s silence allows the atmosphere to press in on the player in Dead Space, so too does Jack’s reluctance to speak. Jack is clearly confused by underwater madness of Rapture and it’s equally doolally occupants, and we share in his puzzlement. Booker DeWitt is Jack’s opposite when it comes to all things oratory. Not only does he spend the length of the game conversing with the ever-enchanting Elizabeth, but he will also comment on pretty much anything remotely interesting. Whilst Jack is determined to sneak and creep around the maze of pressurised tubes of the underwater asylum, DeWitt bounds around Columbia, commenting on the scenery, the enemies he faces, the contents of bins…everything. Now of course, these are two very different games. Yes, one is in the sky and one is in the sea. The moods and atmospheres are different. The stories too, are contrasting. I believe that the use of speech in BioShock Infinite was necessary for such a dramatic change to work. DeWitt’s relationship with Columbia, Elizabeth and his back story would not carry the same narrative weight without his verbal contributions. It also goes some way to showing that FPS protagonists can have voices. Although… Infinite does have a few weird moments where DeWitt is talking about things he remembers… but you’re playing as him and only hearing these things for the first time… which means the way you perceive Booker and his surroundings are different to how Booker sees things…which means you’re not seeing the world from his perspective… but you are literally seeing the world through his eyes… now I have a nosebleed. How do you feel about silent characters that gain voices, or the games that abandon the silent character? Do you disagree with my assessment of any of these sequels? ← The Search for the ‘Ideal’… Melee Weapon.